Yeshayahu Horowitz, severely wounded in Alon Shvut stabbing attack, recalls moments of terror. Professor Avi Rifkind, head of the Trauma and Emergency Medicine Department in Hadassah Hospital, visited Wednesday with Yeshayahu Horowitz - one of the men badly wounded in the stabbing attack at Alon Shvut Junction. Horowitz served as a medic during his compulsory military service. His medical condition has improved in the past few days. Dahlia Lemkos, 26, a resident of Tekoa was murdered in the terror attack, while another man was lightly wounded. He was brought to Shaare Zedek Medical Center in Jerusalem with superficial stab wounds to his face. 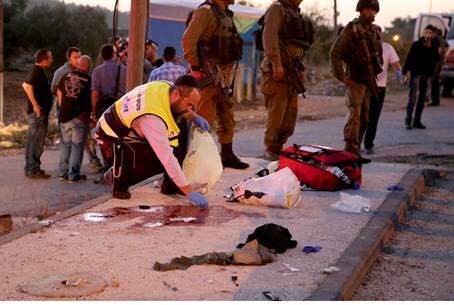 The attack began when a terrorist driving a car with Israeli plates attempted to run down people waiting at a hitchhiking stand at Alon Shvut Junction in Gush Etzion. When that failed, he got out and started stabbing people. The incident took place just hours after a stabbing attack in Tel Aviv, in which an illegal Palestinian worker attacked a soldier out of the Hahaganah Train Station. The soldier was critically injured in the attack and later died of his wounds. Professor Rifkind was the one performed surgery on Horowitz when he first arrived at Hadassah University Hospital with multiple stab wounds 9 days ago. "When I saw a woman lying on the road, I stopped the car and wanted to get help. I thought it was an accident," Horowitz explained. "I then realized it was a terrorist and I ran to him. We started to struggle and as I reached to grab the blade, he tried to cut my face. We fell to the ground, but I managed to hold onto the knife. At the same moment people with guns arrived and I shouted to them in Hebrew, so they'd know I was not the terrorist. I shouted to them: 'Take him!'" The terrorist, Maher Hamdi al-Hashalmoun, was also injured in the attack. He was shot by the security guard of the Alon Shvut community. al-Hashalmoun was brought to Hadassah Hospital in serious condition. Al-Hashalmoun, 30, is a resident of Hevron affiliated with Islamic Jihad. He was imprisoned in an Israeli jail for four and a half years from 2000-2005 for throwing a firebomb at an IDF patrol officer.